We're working on revising SetCronJob system, and there will be more changes coming soon. When you upgrade/renew your account, we only accepted PayPal payment. PayPal has a limited list of supported countries, so we've just added FastSpring payment gateway. They'll process payments from many more countries, as well as support other payment methods like credit/debit card, Amazon payment, wire transfer, etc. To make a one time payment via FastSpring, visit Account > Payments, click Make a one-time payment. After entering your desired amount, click Make a payment, and you'll be redirected to FastSpring to complete your payment. The payment will be reviewed manually before processed. The credit will be applied to your account balance, that you can use to upgrade/renew your plan directly. 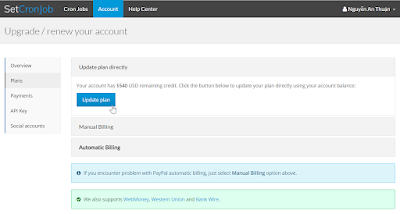 You can now update your plan directly using remaining credit and account balance. No extra payment required. This will be handy in case you want to change your plan after upgraded. You will need to cancel your current PayPal subscription first (at Account > Payments); then visit Account > Plans, click Subscribe on desired plan, and select Update plan directly. If you have any question or feature suggestion, please feel free to email me. On August 20, 2016, I registered my own company named Develover Company Limited, based in Vietnam. From now own, SetCronJob will be owned and operated by my company. I've just rewritten SetCronJob code base with a new framework. There are some minor changes, while most core features and settings are kept intact. If you encounter any problem, please try reload the page (hit Ctrl - F5), or contact me if that doesn't work. I simplified and categorized all the fields into subsections demonstrating how SetCronJob works: Basic settings (cronjob URL and time settings), Connect to your server, Send HTTP request (HTTP method and post data), Detect failure and notify you, Name and group, and Advanced settings (just for me doing some special stuff with specified cronjobs). Since I don't see the actual needs with multiple addresses, I just simplified it. You can update your contact information at Account > Update info. The contact information will be included in the PDF invoice too. will not be supported. For backward compatibility, it will be redirected to GET requests. I removed the FAQ (frequently asked questions) page, and added the Help Center at https://support.setcronjob.com/. If you have any question, just ask me, and if it's a common problem, I'll add it to the Help Center. The free account offer has been being there since SetCronJob started in 2009, and it's finally time for us to kiss it goodbye. Starting at Jan 18, 2016, we'll no longer offer free account for new users. All existing free users can continue using their accounts until Jan 18, 2017. After that we'll remove the free plan completely. If you need any help, or have any question, please feel free to email me. We're very pleased to announce that 3 new servers are being deployed to achieve High Availability. With this deployment, we can minimize service downtime. When one or even two servers fail, the others can still handle all cronjobs processing, and we can easily stop, add or remove any server for maintenance or upgrade. When will the deployment complete? The deployment will be started at 2:00 AM, Monday, January 25, 2016, UTC. Estimated time: 2 hours. Duration that time, we'll copy the whole database into new servers' database. We'll also disable most of our website functions to keep the user data intact. What are new server IP addresses? We'll still use the same IP addresses from one year ago, except that we'll replace the IP address 173.255.210.98 with 45.33.48.85. We'll be sending emails from these 3 new servers, while the IP address 173.255.210.98 get blacklisted at SpamRats. They blacklisted the whole Class C IP address (means 173.255.210. *), and that can't be helped. All servers are in Fremont, California, USA. Are there anything else changed? Besides one new IPv4 address and 3 new IPv6 addresses, we also remove the server selection feature. It's already removed now for newly created cronjobs, and existing cronjobs with no server selected. 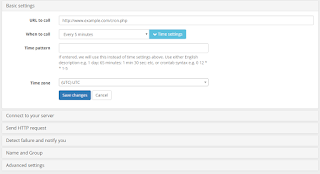 All cronjobs will be processed randomly from 3 new servers, and you can't change that. 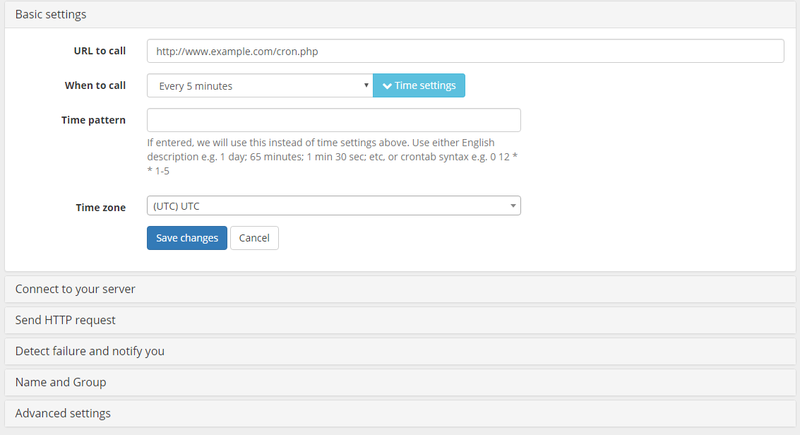 It's to make sure the 3 servers are load balanced, and when one server is down, your cronjobs can still be executed by other servers as well. Will my cronjobs be affected? Please contact your hosting provider and ask them to whitelist our new IPv4 and IPv6 addresses. Please update your CDN service (e.g. Cloudflare) settings to add our IP addresses to its whitelist. Contact the CDN support staff if you're not sure how to do it. Do the same thing: add our IP address into your firewall whitelist. If you only allow some IP addresses to trigger your script, please update your script so it'll accept our new IP addresses. If your cronjobs may be affected like these cases, you should resolve it now. After Jan 25, the change will be applied and your cronjobs may not work. If you think your affected case is not listed here, leave a comment below or contact me. How can I know if my cronjobs are affected? - If your server firewall blocks our requests, we won't able to connect to your server. In the cron execution results, you will see the connection error messages, e.g. "connection time-out" or "connection refused". If that's the case, please contact your hosting provider and ask them to whitelist our IP addresses. If you didn't contact your hosting provider regarding their firewall, and they haven't ever block our IP addresses, then it's very likely that they won't block our new IP addresses. So, nothing to worry. - If you needed to add our IP addresses to your script whitelist before, just add our new IP addresses to it now, and that's it.